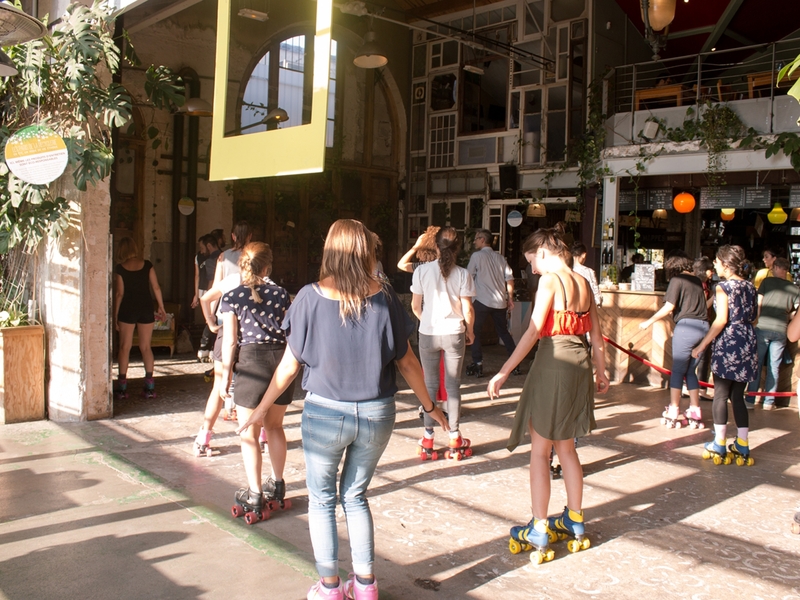 Summer in Paris is the occasion to skate with the Clique during unusual events. Flaneurz collaborates with La REcyclerie and invites you. Darwin is an old barrack, restored in an alternative ecosystem. Flaneurz opened a pop-up store during four days, from Wednesday 17th to Sunday 20th of May. In the same way, La REcyclerie is a renovated station building four years ago. La REcyclerie is an eco-friendly and responsive place which follows the seasons to organize itself. 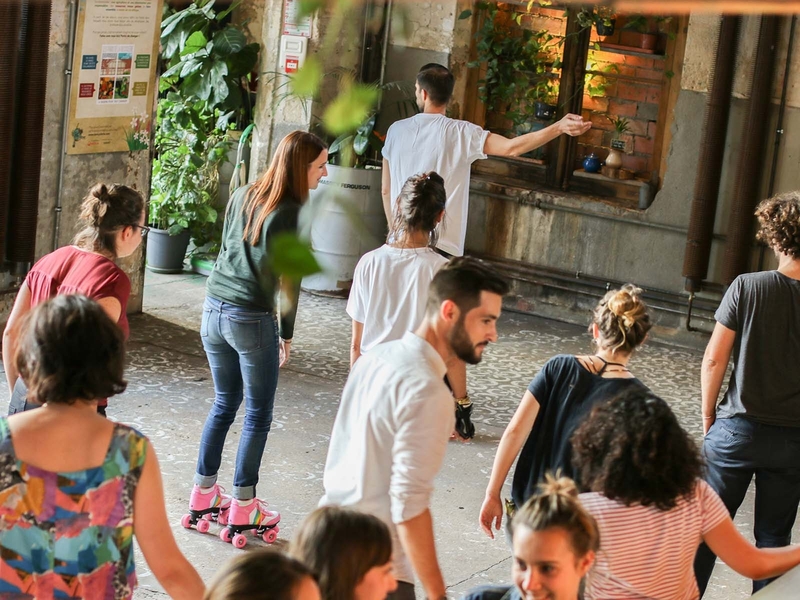 La REcyclerie offers a diversified program about sustainable development and ecology values: canteen, dialogue place, conference and party room. Flaneurz offers a sustainable and environmentally friendly new mean of transport. 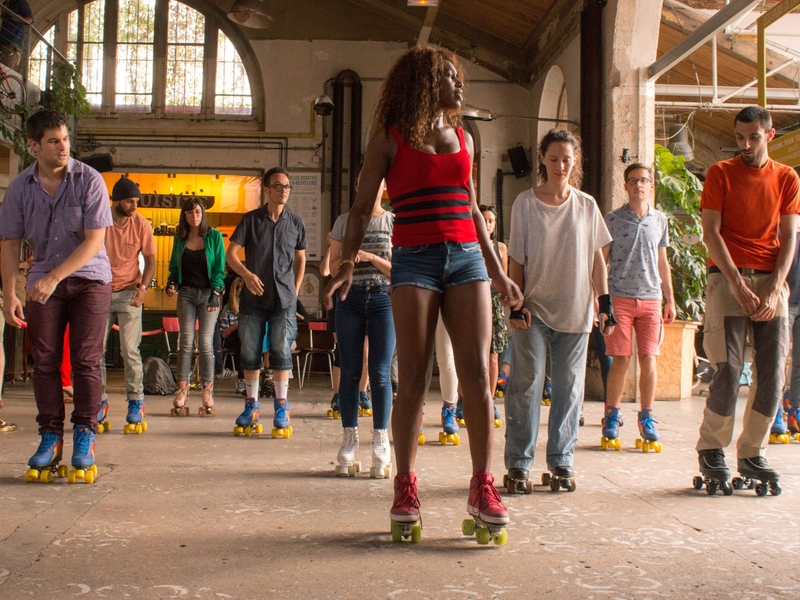 Our two entities combine themselves to make you dance this summer in Paris, with skates on your feet. The entrance is free and you can come with your own skates. Flaneurz makes available its skates stock, such as the event Flaneurz at the W Paris - Opera. Skates rental is at 5€ for the evening (in cash or credit card). 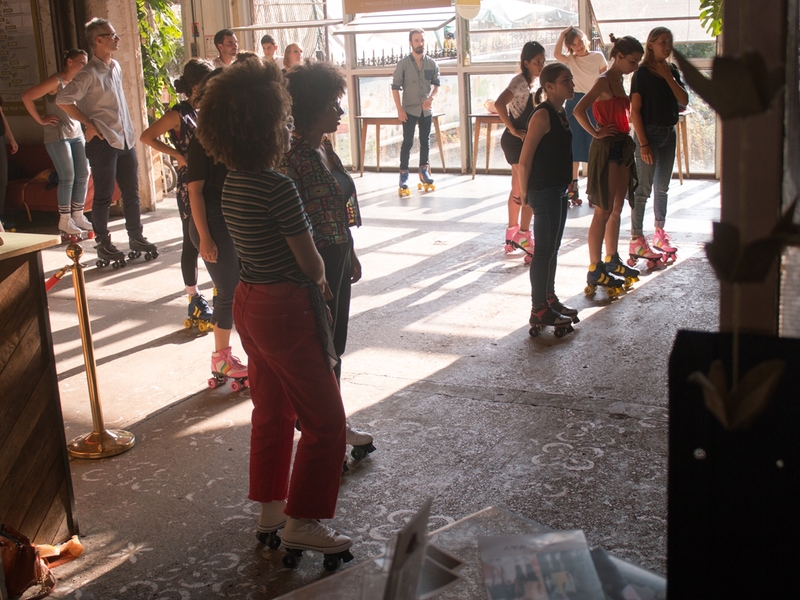 A lot of people enter in the Pas Perdus room at La REcyclerie for roller dance workshop before the “ Apero patins ”. 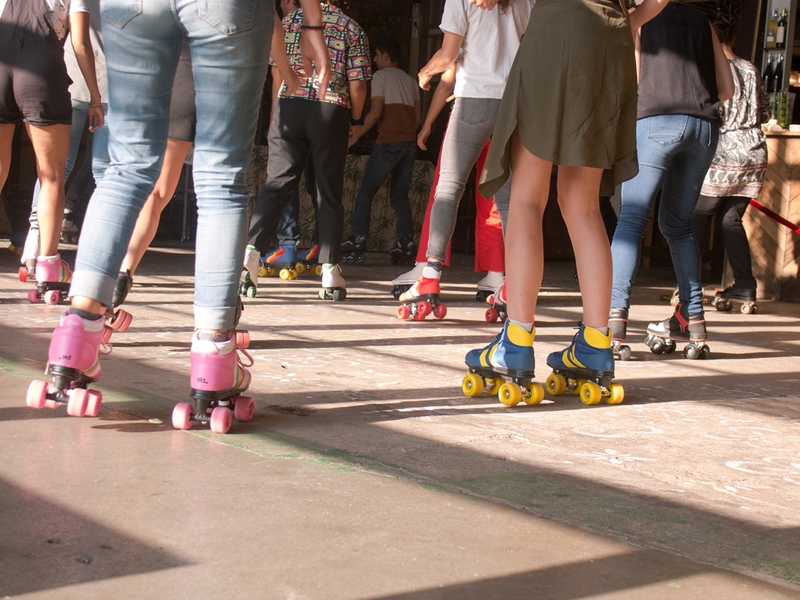 To make you practice with confidence this summer in Paris, our collaboration with this responsive place starts with skate basics learning (physical position, braking) and a roller dance initiation. 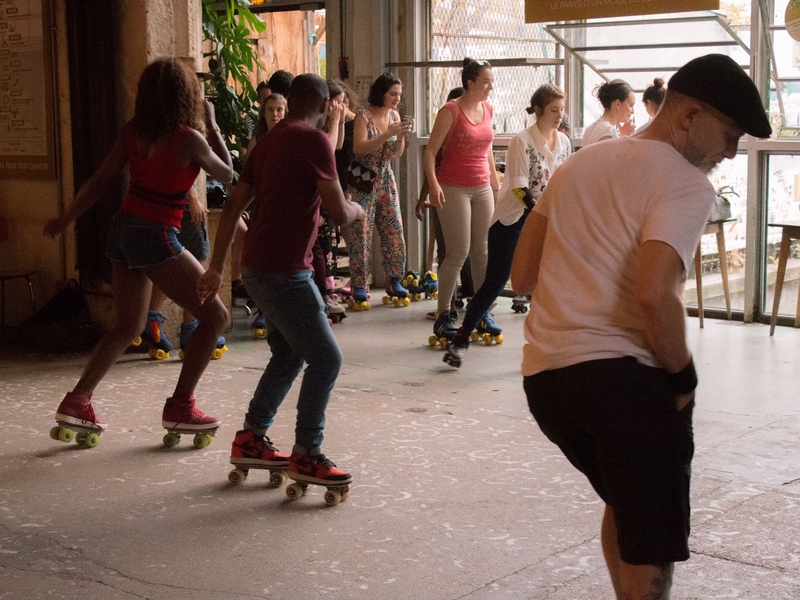 At 6:30pm, strollers put on their skates to learn the choreography created by Florian Gravier, Flaneurz co-founder and member of SkateXpress roller dance crew. During this workshop, Flaneurz ensures musical atmosphere before artists arrival. BORN BAD RECORDS is a contemporary rock label founded in 2006 by Jean-Baptiste Guillot. A big part of label artists are french. They compose different musics and they preach musical revival. At 6:30pm, the Apero patins starts. You begin to wiggle on Guillaume MARIETTA, JC Vox Low and Forever Pavot tracks. Some of you invest the dancefloor whereas some other prefer taste the cocktails made by La REcyclerie bartender. 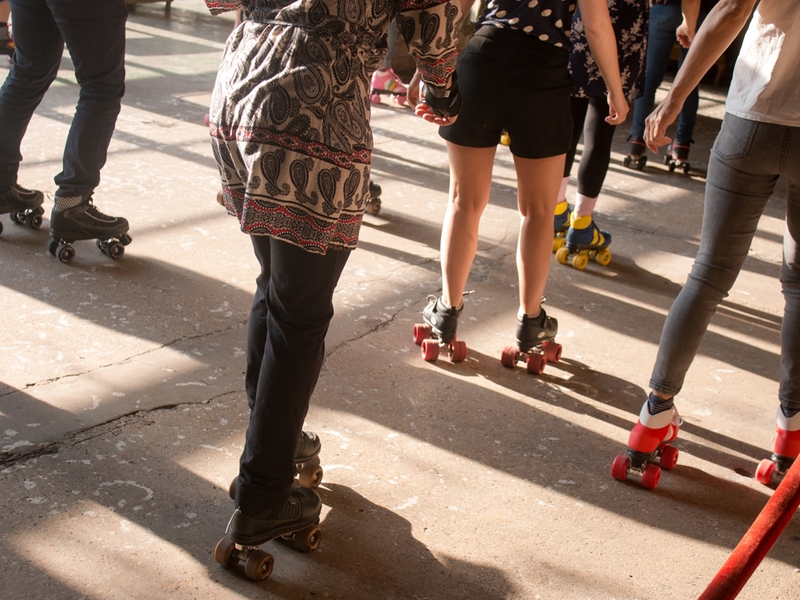 Never mind you are beginner or seasoned skaters, you ride across the room. Guillaume MARIETTA makes you dance on his raw songs with folk and pop tone. Forever Pavot transports you into his universe, between psychedelic, pop and 70’s cinema scenes. The JC Vox Low duo follows your dances with a disco tainted punk. During the party, we meet some of you with Flaneurz: Adidas Top Ten, Nike Air Force One, and Veja V-10 Nautico Pekin. For those who do not know us, you discover some detachable “Ready-to-Roll” skates models. Between improvised choreography, crazy dances, and controlled skids, the party was full of emotions. 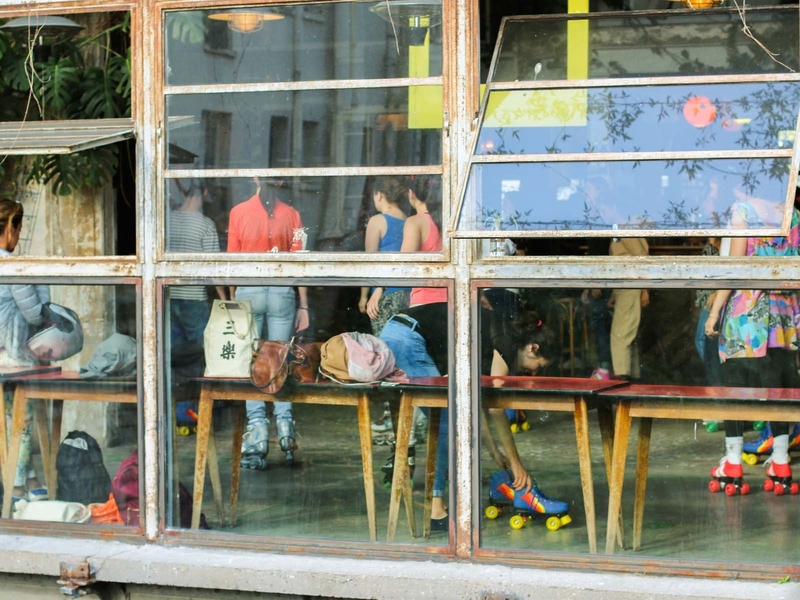 Apero patins new edition at La REcyclerie on July 19th: DJ WALKMAN, DJ KAKASHI and RATHA LAO offer us hip-hop atmosphere. We were expecting you, and once again you were present. Whether you came to stroll, dance, or simply to spend an evening with friends, we were proud to welcome you and introduce you to our sliding sport. Laurence Sabas, Flaneurz ambassador, roller dance teacher and SkateXpress’ crew member assured event first part. With the Gloria Gaynor song “I will survive", all of you caught up in trust and let themselves be seduced by rhythm. The workshop offered a festive skating evening. Summer in Paris is full of surprises! You appreciated this unique place and concept. "Very innovative and attractive project. Some of my friends are ready to join Flaneurz adventure". Once again, we enjoyed spending this time with you. You have come to meet us with your Adidas Matchcourt, Doc Martens Cavendish or Vans pairs. Flaneurz at your feet, you've enlivened the dance floor. 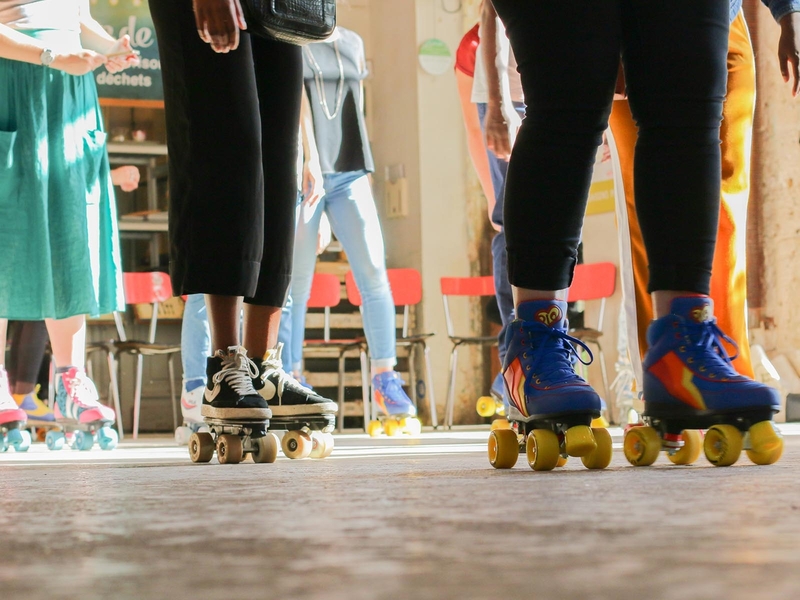 For the third time this summer, Pas Perdus room has became a roller dance floor. 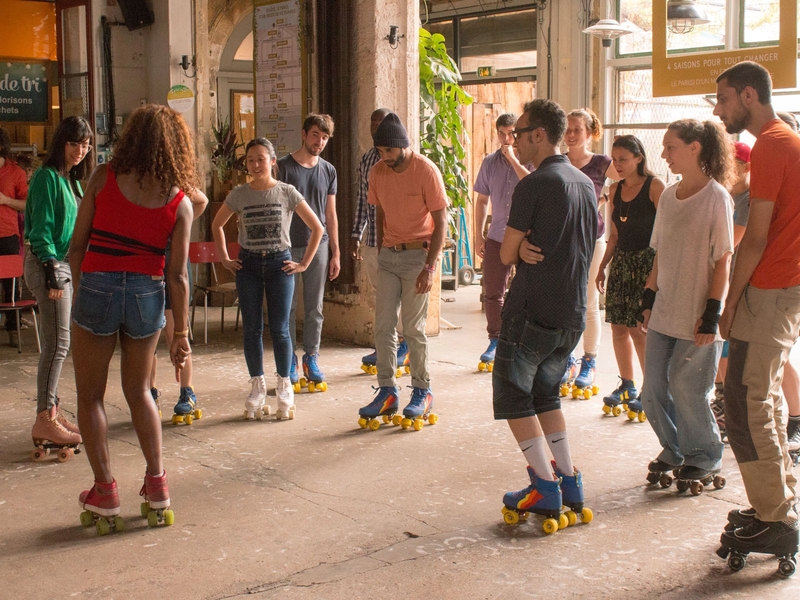 A few minutes after our skates park set-up, you came to meet us for this last summer workshop. 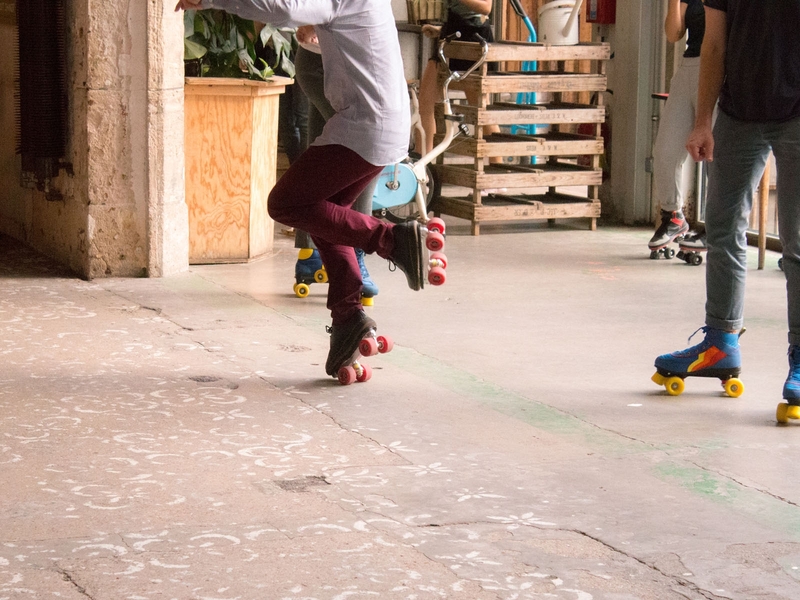 Florian, a Custom Flaneurz pair on feet, take you into his world by offering you an introduction to roller dance. Evening begins: once again, you have lit up the dance floor and made rapid progress. Some flâneurs joined us, and surprised dancers by clipping their rolling part. On the “garage”, punk, 60’s and rocksteady tunes, the Gone With The Weed label and Vicious Soul association have came up with a universe that highlights underground players in rock music. On these energetic notes, we finished August month roller on feet, by your side. Our collaboration with La REcyclerie will have given life to three unique and atypical evenings. Thank you for your enthusiasm and you good vibes! You are real skaters. We can’t wait to see you on our next events. While waiting for the W Paris - Opéra Roller Week, feel free to join us on our social networks (Facebook, Instagram and Twitter) and to subscribe to our newsletter to receive our news! See you soon for the new offer launch. To spend the most beautiful summer in Paris, spend it with Flaneurz!